Velvet Touch Kennel would like to thank you for your interest in our beautiful precious little Teacup Yorkshire Terrier puppies. We are Breeders of Teacup Yorkies. We have lots of pictures of our Tiny Teacup Yorkies. We are very proud of all our little Yorkies and work very hard to provide to you the healthiest and best quality Teacup Yorkie puppies available. Most all the Puppies we have sold was shipped off from here at our local airport, located here in Alexandria, Louisiana "Alexandria International" to many nice homes in the United States. We have had great success with the deliveries that the Airlines have provided for us. We are sure you will enjoy all the fine pictures, animations and music as you tour through our Yorkie site. 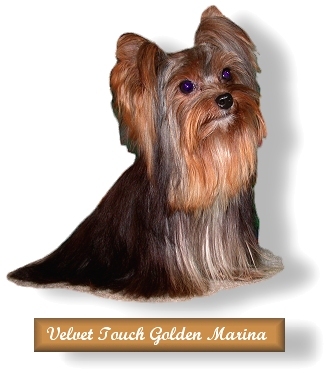 It can be very relaxing as you enjoy the beautiful Pictures of Teacup Yorkies here at Velvet Touch Kennel. When you are done, your comments on our site and Teacup Yorkie Puppies are very welcome. Also take a look at our Teacup Poodles For Sale and Teacup Poodles we have sold also Toy-Tiny Toy Poodles we have sold. A Little information about Yorkies from the American Kennel Club. Size average between 3 and 7 pounds. Some of our Tiny Teacup Yorkshire Terrier only weigh 2 pounds. Yorkshire Terriers, affectionately known as "Yorkies," offer big personalities in a small package. Though members of the Toy Group, they are terriers by nature and are brave, determined, investigative and energetic. They have long, luxurious blue and tan or black and tan coats. This portable pooch is one of the most popular breeds according to the AKC Registration Statistics. Yorkies are easily adaptable to all surroundings, travel well and make suitable pets for many homes. Due to their small size, they require limited exercise, but need daily interaction with their people. Their long coat requires regular brushing. All Yorkies must be cared for daily. This means proper diet, exercise, grooming and Veterinary attention. Do not attempt to be your own Veterinarian! All Yorkies should be regularly examined by a Veterinarian and inoculated against the major infectious canine diseases. They need annual dental cleaning and booster Vaccinations. These are active little dogs, who need to run and play. They are very curious about all noise and activity going on around them. Just playing with them daily is good exercise for both you and them. They love to go for a walk. They need to unwind, especially after being housed or confined to a small area. If your Yorkie zooms around the house like a speeding bullet, it is a sign that he needs more attention. Take him for a longer walk or let him play in a fenced yard. They love running and playing when young but will slow down with age. If it's beautiful Teacup Yorkies your looking for, you've come to the right place. We have Teacup Yorkies for sale most of the time. Our Yorkshire Terriers by Velvet Touch Kennel are some of the smallest, most intelligent and lovable Teacup Yorkies your going to find. We invite you to take a look at our precious tiny baby doll face Teacup Yorkie Puppies for sale. Also be sure and look at all our Teacup Yorkshire Terrier puppies that we have sold and placed in loving homes all over the United States and Canada. We are always updating our site with new Teacup Yorkies and Small Yorkie Puppies. All of our Teacup Yorkie puppies are sold as loving pets, but many have show potential. They are all AKC registered by the American Kennel Club and come with puppy papers. Email us or give us call.